Hacienda Baru is a private nature reserve with 330 hectares (815 acres). It was declared a National Wildlife Refuge in 1995. This place has passed through different changes, from pasture area and cacao plantation to a conservation area. They have worked hard to make this place a biological corridor that helps many animals. 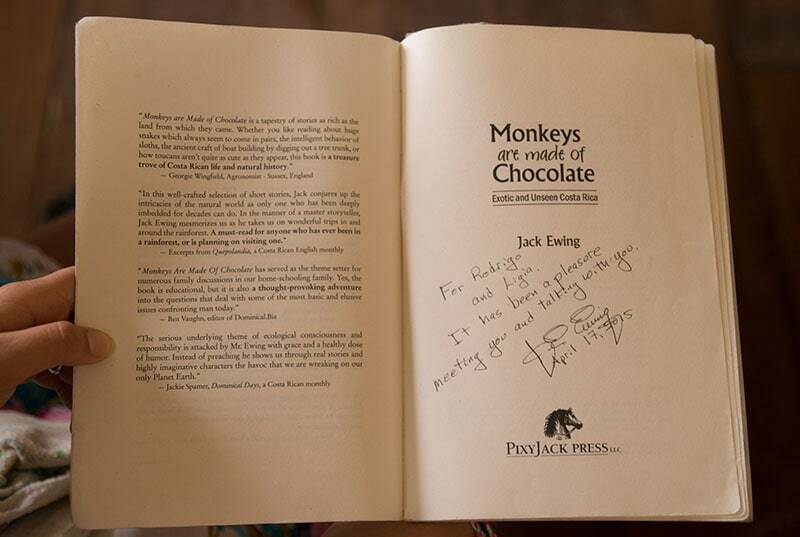 The current owner of this place is Jack Ewing from the USA; he wrote a book that is called “Monkeys are made of Chocolate”. When I heard about this book the first time, it sounded interesting to me. I was working as a tour guide at biological station. At that time one of my coworkers recommended this book because it talked about the natural history of animals in a funny and different way. Indeed the book’s name got my attention. Why Are Monkeys made of Chocolate? Where? How? So I went to San José downtown to get mine at the 7th street bookstore (which doesn’t exist anymore), however, some people have found it on Amazon. The book is fun and made me laugh out loud while I read it. Chapter number 7 talks about Mr. Ewing’s experience with a toucan. He thought that toucans only ate fruits and was shocked the first time he saw one toucan with a baby bird in his/her peak. While I read this book, something inside made me want to visit this place. So 1 year after reading this book and hearing about this place, I planned a visit with Ligia for her birthday. Ligia and I were not sure how to get there by bus but it was not difficult at all. We took the bus to Dominical beach at Tracopa bus station in San José. We stepped off the bus into the bright and hot sun, after walking 1km, we got to Hacienda Baru. I asked the lady at the reception desk for Mr. Ewing. He was not there right then but said he would be back at 4 or 5pm. I went to the reception at that time and my first impression of Mr. Ewing was that he was a nice gentleman. However, after talking for an hour and half- my first impression was more than confirmed. He was so informative and inspiring for me. All the work that they have done can be reflected in these pictures of the great reforestation. After this conversation with Mr. Ewing, I was able to get his signature in my book and take a picture with him. I was so happy about that! Also, we had dinner to celebrate Ligia’s birthday and the food and service were amazing. The next day we woke up early and had our breakfast there and then toured the property. There were several trails and you can see wildlife all around- from caimans and birds to monkeys and even more. Most of their employees are from the area, so it gives the opportunity to them to support their families and not depend only on fishing or agriculture. Many hotels or companies they call themselves “GREEN” but it is not true. However, Mr. Ewing, his family, local people and other organizations have made a really big effort to reforest the area and turn it into a corridor for all wildlife. Mr. Ewing took part of his time to explain to me what he has done. I could believe what he told me about the schools’ program that they have where kids come into Hacienda Barú and the tour guides show them about the importance of the conservation of the wildlife. This year was a very special birthday to me. My husband, who is a nature lover like me, decided to take me to the rainforest in the southwestern part of the country. To be specific we stayed in Dominical at the Hacienda Baru Hotel. He told me that we were going to the beach so I was really excited but what I didn´t expect was to be at the beach and the rainforest at the same time, so it was a really good mix of two of my favorite ecosystems. Since it was my birthday that night we had dinner at the restaurant and the food was really good. I had my favorite food which is spaghetti !!!! How delicious! A perfect ending to my birthday! The dessert was crepe with chocolate inside and out with vanilla Ice cream! But the weekend had more things to offer than the Hacienda Baru. The following morning we decided to walk the trails (I have to thank the staff that let me borrow tennis shoes! Yes, I felt embarrassed to admit that I thought we were only going to the beach but at this place, you will for sure need sneakers). Ok back to the trail, the experience was amazing we have done a “couple” of trails in Costa Rica J and this one made the forest come alive. A lot of noises in the area next to the trail told you that there were other creatures around. My husband has an incredible ability to observe animals in places that nobody can see and got to see a caiman and lots of other birds (every day I learn with him how to recognize more)….Coatis, anolis, and the “Jesus Christ Basilisk”. It made for a really nice morning walk. We spent some time at the beach where I can tell you there are rip currents but just the magic to see the beach and the greenest forest is worth it. The scenario makes your mind soar and thinks of how awesome and perfect the natural ecosystems are and understand why our ancestors protected it. Our last day we decided to go on a short walk to a place that they have called “The Tower”. It´s a birdwatcher tower on the top of a small hill and the top floor puts you at the top of three levels. That morning we were able to see a group of White Faced Monkeys face to face. The group was made up of 3 babies, 1 adolescent and 2 adults (according to the dynamic similar to a human family with a mom and the dad). The mom was holding a baby and the dad was laying on a liana, very relaxed. They seemed happy and our presence didn´t bother them at all. We took some pictures when we decided to open his tripod and that was the trigger that made the dad angry with us like he had seen a rifle. The adolescent also became angry and tried to intimidate us, we wisely decided to take our “rifles” down and wait because we didn’t want to bother them or have them come down from the branches. The dad did the order to leave and with peaceful movements, they started to jump branch to branch. And then we got the chance to witness what the book refers to as monkeys and chocolate. Before they left the mom put the baby down and stopped to grab a fruit that we think was cacao fruit which is what chocolate is made of. She finished quickly as not to stray from the family. It was a really cool experience at the tower with the monkeys and I am glad that we could watch them eating cacao. At the end, the monkeys and I tasted the chocolate in different ways at Hacienda Baru. We agree that Hacienda Baru is an example of ecotourism where the solidarity with nature is real and instead of being a big hotel with luxury pools and rooms it´s a luxury habitat for all the species that are protected here. Congratulations to Mr. Ewing and all the people that made this project possible!!!! This place is located it, 3 kilometers before you get to Dominical town. Here is a map to help!